Owner of Hunstman barbers, Kyle Ross. Huntsman PR images. 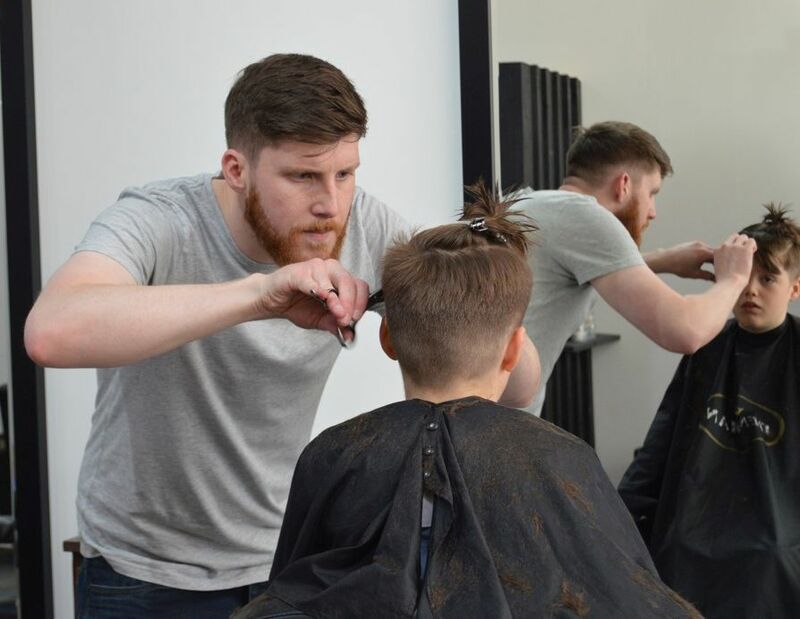 A young entrepreneur has invested a five-figure sum to land a new barber venture in Aberdeen. 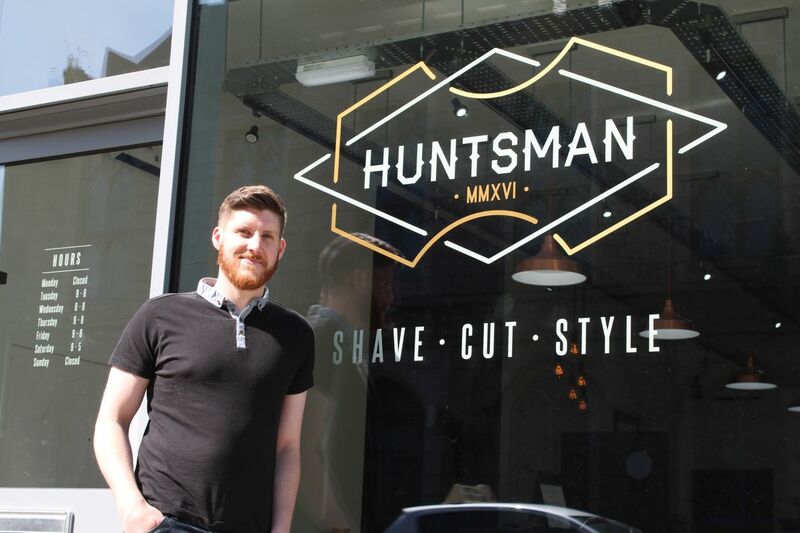 Huntsman, a new luxury gents barbers based in the city’s Union Street, has officially opened its doors after a month-long renovation on the city centre property. Established by managing director, Kyle Ross, the business has committed to a ten-year lease and has created three jobs, with plans to increase this in the future. Mr Ross, 27, has almost ten years of industry experience and has worked in some of Aberdeen’s top hair salons. He now hopes to bring the innovative barbering trends that are taking bigger cities by storm to the Granite City through his new business venture. The barbers, which is based between Union Street and Albyn Place, offers a wide range of services for the modern day man, including everything from precision cutting, hot towel shaving, beard trimming and styling, to massage treatments and waxing. It also provides in-depth consultations to its customers, which allows them to decide on the cut and style that will best suit their face shape and hair type. 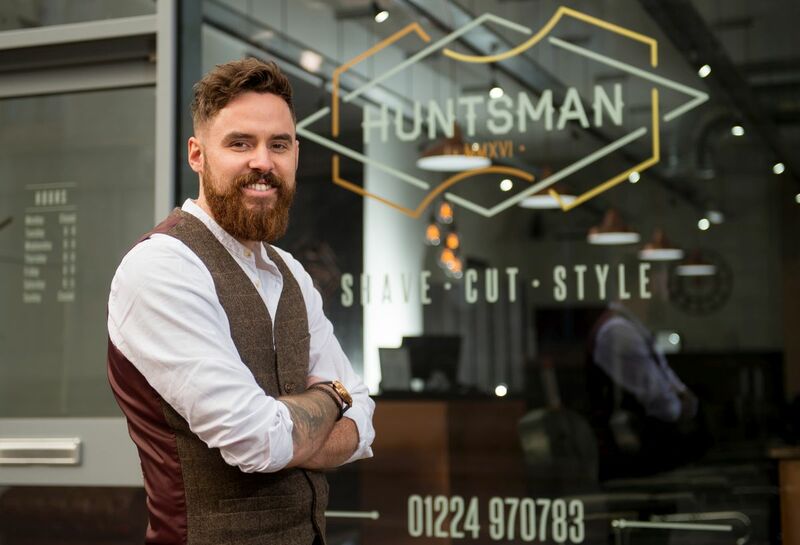 Named after the inventor of the straight razor, Huntsman is the only barbers in Aberdeen to stock stylish Hanz de Fuko hair products and is the only one north of Glasgow to offer the distinctive Brighton Beard Company products to its clients. The 950 sq ft premises has an additional 500 sq ft basement for possible expansion. It features a stylish, contemporary interior, with a black and copper colour scheme, and has a 50” plasma TV screen dedicated to playing Sky Sports. “It was always part of my career plan to open my own place, so I’m thrilled that all the hard work has paid off and my dream has become a reality. “I realised I had a flair for the barbering side of hairdressing and I enjoy following gents trends. It is certainly an exciting time for barbers, as there has been a dramatic change in behaviour in regards to male grooming over the past few years. Men tend to be much more image conscious and it is now all about slick haircuts and facial hair. “I wanted to create an environment that was completely different to the walk-in barbers that most men are used to. Guys can relax in the knowledge that we will spend as much time that is needed on their hair, rather than just a quick five-minute job. We talk customers through the entire process and give them guidance on what styles would suit them best. Local charity and support group Friends of Anchor came up with an ingenious way to raise funds and awareness: they decided to hold a fashion show with models who survived a cancer diagnosis. Suzanne Kelly covered this event for Aberdeen Voice and found it one of the most uplifting and inspirational events held in our area for quite some time. Friends of Anchor decided to put on a fashion show to raise funds – but not just any fashion show. The women would be community members who had been diagnosed with cancer and overcame it with help from the Anchor Unit. The call for models received an overwhelming response; it was only a pity that only 24 could be selected. 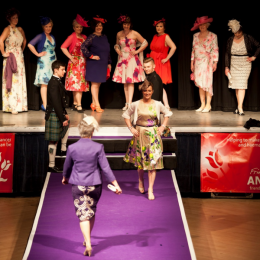 After months of fittings and rehearsals, these amazing women took to a catwalk erected in The Beach Ballroom. The ticket demand was beyond organisers’ dreams – all tables sold out quickly, and demand hadn’t abated: they had to open the balcony for seating without food service for both the afternoon tea and evening dinner shows. All tickets were taken. A raffle was held; and a tombola-style ‘tree of indulgence’ was hung with 500 tickets, some linking to fabulous prizes. The organisers hoped to sell most of the tickets by the time the evening show concluded: in the end, all these tickets were snapped up at the afternoon show. The table was laid for afternoon tea in a beautiful style; the food was delicious. The clothing on show had something to offer every size and age of woman. Stalls around the room sold a variety of goods. But all this paled in comparison to the models. Each gave a brief description of their individual situation in the programme; several were featured in video vignettes showing how they dealt with their problems, how their friends and family were on hand to help, and how the Anchor Unit provided personal, state-of-the art health services geared to the needs of each individual. There were older women; younger women; a pregnant woman, and one particularly courageous woman, Laura, who was still being treated at the unit. She first took to the catwalk without wearing a wig (like many if not most, her hair had fallen out during treatment). She was radiant. There were casual outfits, wedding and evening clothes. The women were given the warmest of welcomes from the crowd, which seemed to clap nonstop. Their attitudes to their medical problems marked them out as extraordinary people; it was really an honour to have been there. Speeches were made by charity patron Jimmy Milne of Balmoral Group and the Lord Provost. 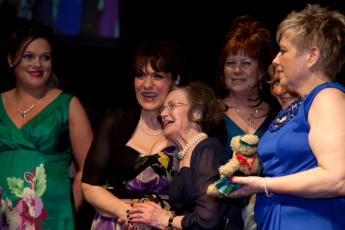 Sarah-Jane Milne and Sandra McIntosh of Total were also speakers; it was announced that the afternoon event had made £39,000+ – the target for afternoon and evening events, with all proceeds going directly to the charity with no overheads to pay. The models were: Ashlea Corvelle, Christina Farquhar, Dawn Laird, Erica Matthew, Fiona Vass, Gail Roberts, Joan Cordier, Joanna Strathdee, Judith Logan, Judy Alexander, Julia Riddoch, Kathleen Haw, Katrina Farquhar, Kay Sowerby, Laura Atkinson, Laura Brackenridge, Lesley Anne Yeates, Llynda Johnston, Mary McLean, Nikki Dunn, Norma Ben Tebr, Patricia Beckett, Rebecca Grant, and Tricia Howden. For the finale, all the models came out and joined the audience. Moments later everyone was up and dancing and/or congratulating the models on a brilliant show. This event was a huge and happy success story, and hopefully will become an annual event. Art Deco: a style in the decorative arts as defined by a major international exhibition held in Paris in 1925. It had been planned for 1915, but was postponed because of the First World War. The exhibition was a celebration of modernity, of modern materials and techniques. The expression ‘Art Deco’ describes the style which predominated there; a jazzy application of a visual vocabulary derived from Cubism, Futurism, Functionalism and other recent movements to a variety of decorative, fashionable and commercial purposes. There was a shift in emphasis from the Fine Arts to the Arts Decoratifs. Artists now applied their aesthetic skills to all areas of design, ranging from architecture and interior decoration to fashion and jewellery. Oddly enough, the expression ‘Art Deco’ did not come into use until a much later exhibition in London in 1968. In its own time, the style was generally referred to as moderne (not to be confused with’modernist’) and sometimes as ‘jazz’ or ‘jazz-style’. Although it applies to the decorative arts and interior design of the 1920s and 1930s, the description ‘Art Deco’ can be extended to analogous styles in architecture, where it is characterised by smooth, sleek, aerodynamic or ‘streamlined’ motifs, reflecting the contemporary preoccupation with speed and the setting of new land, sea and air speed records. Sunbursts, sunbeams and sun-rays are another very characteristic Deco motif, reflecting the new fashion for sunbathing and the perceived benefits of natural light and fresh air. The ‘Deco’ style created clean simple shapes suitable for mass production in factories using modern materials such as plastic, chrome and aluminium. Even mundane objects like vacuum cleaners and radios were given the Deco treatment, adorned with smooth, streamlined surfaces and sleek lines resembling those of racing cars and aircraft. Following its revival in the 1960s, Art Deco has been seen as the natural sequel to the Art Nouveau of the 1890s, of which the early work of Charles Rennie Mackintosh (1868-1928) provides several examples, e.g., the Willow Tea Rooms in Glasgow. Art Nouveau drew much of its inspiration from the natural world of plants and flowers and is characterised by a sinuous, curvilinear style. A local example of Art Nouveau is the cast-iron Ventilator at the Holburn Street end of Justice Mill Lane. But Art Deco is more a product of the machine age, and is characterised by flat, geometric shapes. Mackintosh at first incorporated a significant degree of Art Nouveau ornamentation in his work, but he later pared down these decorative elements in favour of a starkly elegant and geometrical aesthetic, e.g., the vertical emphasis of his notorious ladder-backed chairs. Art Deco and other aspects of Modernism as applied to architecture were in conscious rebellion against pre-1914 styles such as Victorian Gothic, Scottish Baronial and Edwardian Baroque, which came to be seen as dark, stuffy, cluttered, over-decorated, pompous and impractical. It was now felt that design should reflect function, that function should dictate form, and that buildings serving modern purposes such as railway stations or schools should not be disguised so as to resemble medieval cathedrals or castles. Modernism came to favour asymmetrical compositions, unrelievedly cubic shapes, metal and glass framework often resulting in large windows in horizontal bands, and a marked absence of decorative mouldings or ornamentation. The pendulum of fashion had swung from the one extreme to the other, from Gothic extravagance and whimsy to a style, or absence of style, often described as ‘Brutalist’, if not as ‘Stalinist’. Art Deco may be seen, at its best, as a via media, a happy medium between the over-ornamentation and clutter of the Victorian-Edwardian era and the stark, totalitarian style too often characteristic of the 20th century. Art Deco emphasised stylishness attuned to domestic use and popular consumption, and was characterised by geometric patterning, sharp edges and flat, bright colours, often involving the use of enamel, bronze and highly polished chrome. The simplicity of the style can be seen as Classical in spirit, apparent in the extensive use of Egyptian, Aztec and Greek motifs. This reflected the widespread interest in the discovery of the tomb of the Egyptian boy-king Tutankhamun in 1922. The craze for all things Egyptian coincided with the spate of cinema construction in the 1920s and 1930s, and was often incorporated into both exterior and interior designs, being very apparent in Odeon, Gaumont and other chain-cinemas of the period. The Palace Cinema; the old Palace Theatre was substantially extended in 1931 to create its impressive Rubislaw granite frontage on Bridge Place, which itself stands on a ridge extending from Holburn Street to Crown Terrace. The Palace became a dance-hall in 1960. The building was owned by Scottish & Newcastle Breweries from 1993 until recently, and its shabby and neglected condition did them no credit. It is now a nightclub, operated by Luminar, who have tidied it up considerably. 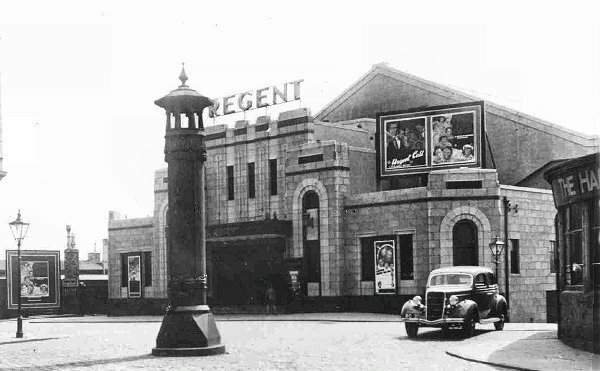 The Regent Cinema in 1927, by Tommy Scott Sutherland (1899-1963), was built on the site of the Upper Justice Mill, at the Holburn St. end of the ridge described above. The Lower Justice Mill was down the brae in Union Glen; its mill-pond lay between the two buildings. The two mills had been in operation well before 1320, when they were granted to the Burgh of Aberdeen by King Robert I, Robert the Bruce, and were still in operation 600 years later in the 1920s. The Lower Mill pond was drained and filled, the three streams diverted and covered and the site was levelled by excavating it back towards Justice Mill Lane. The Regent cinema occupied the eastern part of the site formerly occupied by the Upper Mill; the western part of the site is occupied by the McClymont Hall. 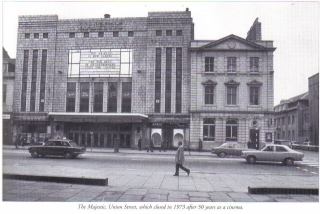 The frontage of the Regent Cinema (latterly the Odeon) was of Rubislaw granite, decorated with bands of red terracotta, with a polished black granite base. The vertical central windows, giving the impression of height, became something of a Sutherland trade-mark, later deployed to useful effect in the Kittybrewster Astoria and the Majestic. 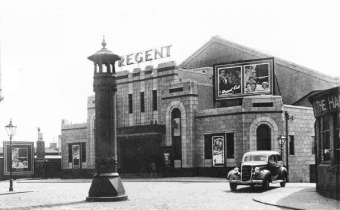 The Regent opened on Saturday 27 February 1932, a few months after the Palace. 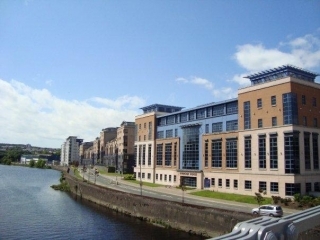 The building is now occupied by the Cannon sports centre and health club. The new owners have renovated the exterior to a high standard, extending to the rear of the car park, where it abuts Union Glen. 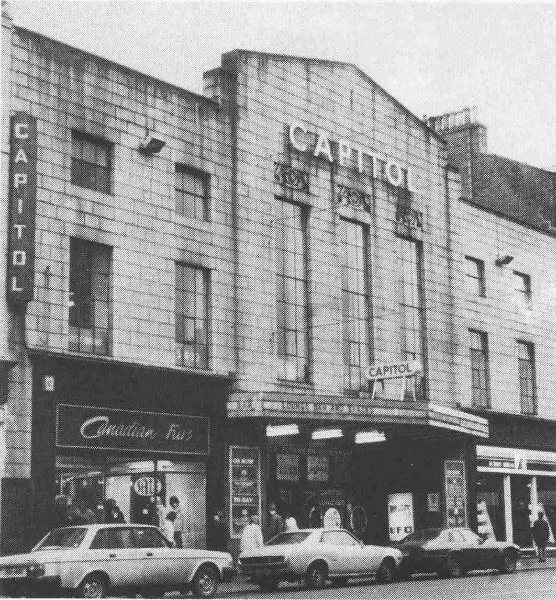 The Capitol in Union Street in 1932, by A. G. R. Mackenzie, had a sparkling dressed granite frontage, slightly asymmetrical in layout. Above the entrance were three tall windows with two shorter windows to the left and three such to the right. The frontage was/is surmounted by a plain but elegant pediment which had the effect of concealing from street view the high, steeply pitched roof of the auditorium. 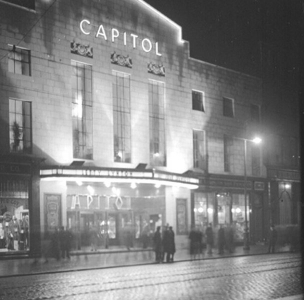 The Capitol had the most remarkable interior of all the Aberdeen cinemas, which included a Compton theatre pipe organ, and it was also the most influenced by Art Deco, both inside and out, e.g., the outer doors with their stainless-steel semi-circular hand plates, forming full circles when the doors were closed. The Capitol opened on Saturday 4 February 1933. Its more recent conversion for Luminar involved the horizontal division of the auditorium into two complementary night-clubs, one upstairs, one downstairs. We are unable to say how this affects the Compton organ, or just what remains of the Art Deco interior. Tommy Scott Sutherland went on to design the Astoria Cinema in Clifton Road, Kittybrewster, which opened on Saturday 8 December 1934. This was followed by the Majestic in Union Street, (opposite the Langstane Kirk), which TSS regarded as his finest creation. It had a fairly plain and austere frontage of Kemnay granite in the style by now known as Sutherland Perpendicular. Jackson’s Garage in Bon-Accord Street/Justice Mill Laneof 1933, by A. G. R. Mackenzie. 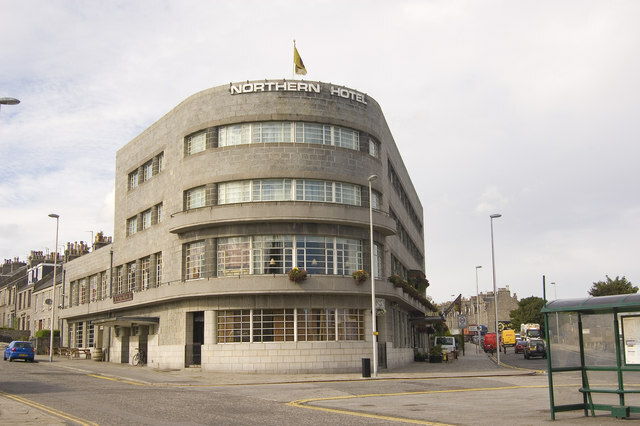 This is a rare example of excellent commercial architecture of the inter-war period in Aberdeen, and has many Deco characteristics. It incorporates the distinctive horizontal banding of windows and glazing, curving around the corner to Justice Mill Lane. The Bon-Accord Street frontage has an impressive central section with three very tall vertical windows surmounted by a distinctive 1930s clock. The building is now occupied by Slater’s Menswear. The Bon-Accord Baths in Justice Mill Lane, of 1937, is one of the most characteristically 1930s buildings in Aberdeen, being a giant buttressed granite box. Inside, there is an abundance of curved blond wood and shiny metal; the swimming pool roof is supported on concrete arches. The window glazing is distinctively ‘Deco’. Amicable House, Nos. 250-252 Union Street, of 1933, by Tommy Scott Sutherland, built just west of his Majestic Cinema, embodies some Art Deco motifs and characteristics. 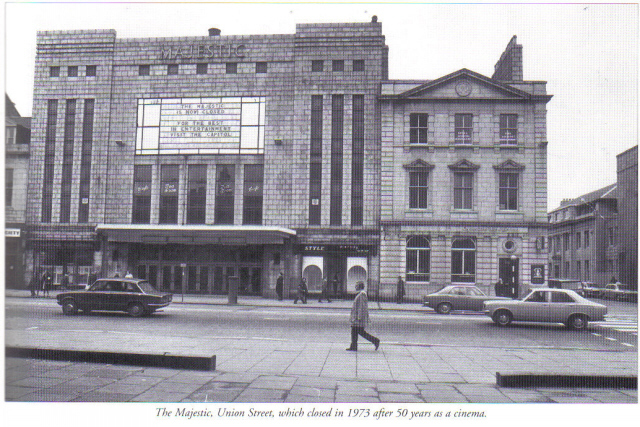 The Majestic was demolished in the early 1970s and replaced by the present bland, characterless office block. The 1930s Medical School at Foresterhill. The King’s College Sports Pavilion of 1939-41, by A. G. R. Mackenzie; one of the few Modernist buildings in Aberdeen before World War Two. Tullos Primary School, begun 1937, but not completed until 1950, by J. Ogg Allan; one of the best 1930s buildings in the city. I should mention the Carron Tea-room in Stonehaven, built 1937 and recently fully refurbished; it may be the finest Art Deco building in the north of Scotland. Finally, the Northern Hotel, Kittybrewster, of 1937, by A. G. R. Mackenzie. 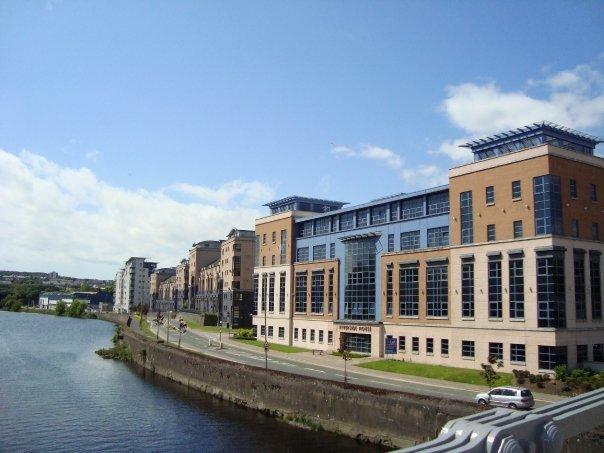 Its curved frontage is dominated by broad horizontal banding of windows and glazing. The Northern Hotel is the most distinctively ‘Deco’ building in Aberdeen, and has recently been fully restored. The interiors are well worth seeing. For all that, the Northern Hotel is arguably more a thing of interest than of great beauty. The Deco style seems to work better in pastel colours and in sunny locales. I used to walk past the Northern Hotel regularly, and it never occurred to me to think of it as a beautiful building; striking, yes, beautiful, no. 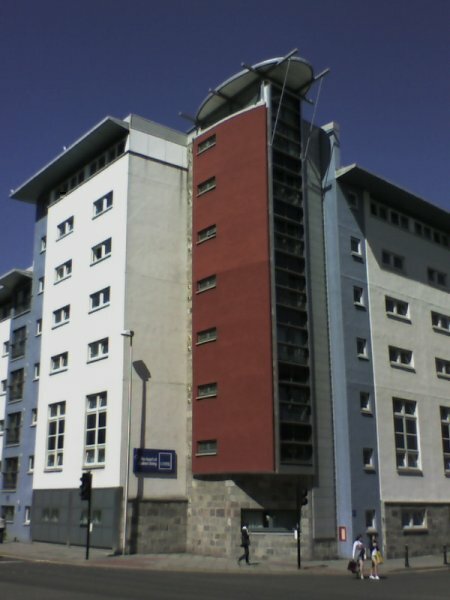 By the time it was built, in the late 1930s, the new architecture of Aberdeen had perhaps slipped too far down that long descent from Victorian Gothic to Stalinist Brutalism; all the way from the splendid Flemish-Medieval Town House of 1867 to the irredeemably awful St Nicholas House of 1967. 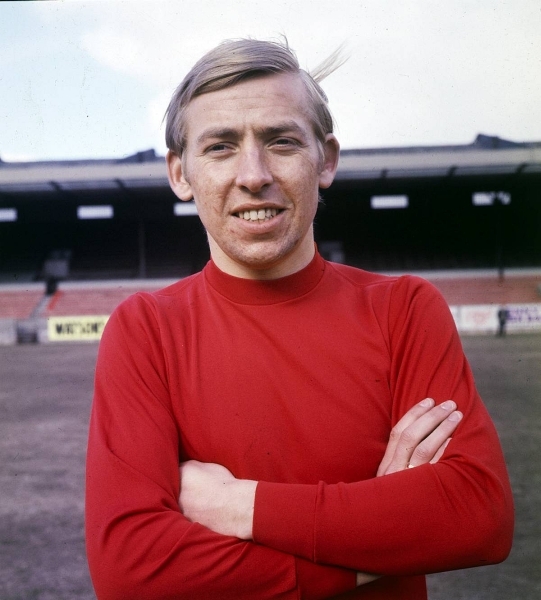 These bitter-sounding thoughts were occasioned, quite some years ago, whilst walking from the Castlegate back to the Brig o’ Dee. It occurred to me that every building I liked along the way dated from long before I was born, and that almost nothing put up in my own lifetime was any good at all. I like to think that things bottomed out, perhaps as far back as the 1970s or ‘80s, and are now on an improving trend, but the evidence is still uncertain. The Lighthouse Cinema; I like those sleek glass curves along the line of the old Shiprow. The huge block of student flats in Mealmarket Street/West North Street is distinctively ‘Deco’ in style, brightly coloured in pastel shades of blue, white and pink/orange. Talisman House in Holburn Street is another symphony in tinted glass with its undulating green roofline, now complemented by Gillie’s new furniture store across the street. Talisman House is certainly a big improvement on the old College of Commerce; but is the Boots/Currys building by the Brig o’ Dee an improvement on the former, much-unloved, Dee Motel? At least the Dee Motel was a low-rise building, set well back and largely obscured by trees and shrubs. The Boots/Currys building might be acceptable somewhere else but, on this prominent corner site, is too big, too far forward and too close to the historic Brig; and it completely dominates the view all the way down South Anderson Drive and out Holburn Street.